A1 balloons offers a range of balloons and balloon decorations for all occasions. Here are some of our most popular items and designs. Click on each item for a further description and add to your shopping cart. We offer a secured payment system run through Paypal. You don't have to have a Paypal account to use this service. At Checkout click on Buy Now and enter your credit card details to complete you purchase. We will contact you by email or phone (if required) to confirm your order. 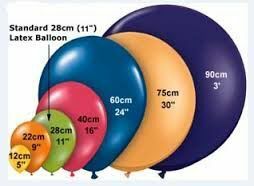 We have a huge range of balloons available in a large choice of colours. If you can't see it below please do not hesitate to ask if we have it or can get it.